If you take a multivitamin, you are not alone. One-third of Americans use a multivitamin to help supplement their health and wellness. Unfortunately, many people use multivitamins incorrectly. Expecting false outcomes and purchasing harmful or inferior products are the most common errors. If you don’t want to make these mistakes, read the following MUST KNOWS about buying a multivitamin. 1.) Using a multivitamin may not decrease the risk of cancer or heart disease. However, multivitamin users tend to be healthier overall. This may be a big surprise to vitamin users. Randomized clinical trials do not show cancer or heart disease reduction with the use of multivitamins. However, most Americans do not eat a balanced diet and could still benefit from taking a multivitamin. Additionally, if you have any dietary restrictions it is likely you could benefit from using a well-balanced multivitamin. Even though randomized trials do not show cancer or heart disease reductions in multivitamin users, people who use multivitamins are healthier. This may seem counter intuitive at first. However, multivitamin users tend to be more health conscious and take better care of themselves. They exercise more and tend to eat better. 2.) Some vitamin ingredients can be HARMFUL. Not all multivitamins are created equally and savvy multivitamin consumers should beware of certain ingredients. Vitamin B12, also called cobalamin, is found in most multivitamins. However, there are many different forms of vitamin B12. The most commonly used is called cyanocobalamin. This manmade vitamin combines vitamin B12 with cyanide. Cyanide is a well known toxin that can lead to confusion, airway irritation, seizures, and even death. While the amount of cyanide in cyanocobalamin-containing vitamins is small, it is best to avoid this form of vitamin B12. Instead, opt for safer forms such as methylcobalamin or hydroxycobalamin. Beta carotene, an antioxidant, can be harmful if used by smokers or those with asbestos exposure — it actually increases the risk of lung cancer. It’s best to avoid beta carotene entirely in your multivitamins. 3.) For Best Results, You Should Eat With Your Multivitamin. 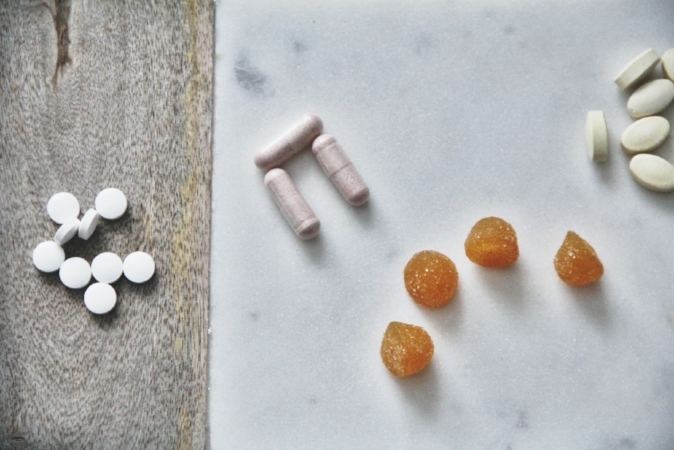 There are two reasons you should eat when you take your multivitamin. First, certain vitamins (such as A, D, E, and K) are fat-soluble. This means they are best absorbed when taken with a small amount of fat. It is best to take your multivitamin with food that contains a small amount of fat. Second, taking your multivitamin with food can help prevent stomach upset or nausea. 4.) Certain Vitamin Forms Are Superior to Others. It is best to take the active form of vitamin D, otherwise known as cholecalciferol (D3). Cholecalciferol is better absorbed and utilized by the body compared to other vitamin D forms. Vitamin E comes as d-alpha tocopherol and dl-alpha tocopherol. The d-alpha tocopherol form is vitamin E in its natural state; the dl-alpha tocopherol form is synthetic and less potent. D-alpha tocopherol is much better absorbed by the body. Be cautious with vitamin B9. Folate describes natural vitamin B9 while folic acid is the synthetic form. Folic acid can be difficult for the body to process into active (usable) metabolites. Furthermore, folic acid has been linked to enhanced tumor development. If you are not a woman of child-bearing potential, consider skipping folate in your multivitamin. Instead, fill your diet with naturally folate rich foods such as leafy green vegetables. If you are a woman of child-bearing potential, be mindful of the form you take. Methylfolate is the safer form. 5.) Taking a daily multivitamin is not a replacement for a healthy and balanced diet. Taking a multivitamin does not give you a free pass to eat junk. A healthy and balanced diet is one of the best ways to positively impact your health. Research reveals that whole foods contain balances of vitamins and nutrients that our bodies can best absorb. Isolating single vitamins and nutrients does not always have the same effect. Congratulations! Now you have a firm grasp on the five things you need to know before buying a multivitamin. Make sure to keep this post in mind next time you buy. What Foods are BAD for Your Health? feel good breakfast recipe, and personal wellness action plan. Get yours today! Your privacy is our priority. No spamming, no sharing, no exceptions. So cute. I can't even. Hope this cheers you up today 😘!